The future of journalism and the news industry depends on media workers and their unions mobilizing the public to pressure politicians to enact supportive policies and legislation. That was the message delivered on Friday to CWA Canada’s National Representative Council at its annual meeting in Montreal. Edward Greenspon, CEO of the Public Policy Forum (PPF) and author of its report The Shattered Mirror: News, Democracy and Trust in the Digital Age, delivered the keynote address and then participated in question-and-answer sessions with delegates. The PPF’s exhaustive study into the state of the news industry found that the broken business model, fragmentation of audiences and the rise of fake news “pose a growing threat to the health of our democracy.” Greenspon noted that one-third of journalism jobs in Canada had disappeared since 2010. 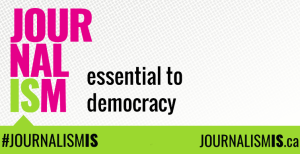 Among the proposals are creation of the Future of Journalism & Democracy Fund to provide financing for digital operators who produce civic-function journalism and for a new “local mandate” for The Canadian Press, which would put more “boots on the ground” to supplement coverage of courts, legislatures and city halls; more funding for CBC so it can stop selling online and other digital ads and concentrate on its mandate to inform and enlighten; changes to tax laws governing advertising revenues and expenses; amend charity laws to allow philanthropic financing of non-profit news organizations; establish a legal advisory service for investigative journalism performed by smaller news services; and an indigenous journalism initiative. Greenspon said he could not predict what action, if any, the Liberal government would take. Asked whether there was a role for media workers in advocating to preserve journalism, he responded that there are 338 MPs. Activists have to work at the local level, co-ordinate their messages, and get the community engaged in pressuring municipal, provincial and federal politicians to support and protect news reporting, he said. 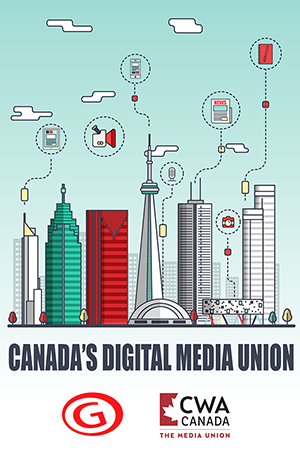 A parliamentary committee that has been studying Canada’s ailing media industry is expected to soon release its report. The Canadian Press reported on Saturday that committee members were struggling to reach consensus on key recommendations on how the federal government could help smaller newspapers. While the existential crisis is more acute in Canada, where the bankruptcy of newspaper monopolist Postmedia would wipe out two-thirds of the country’s journalism, media in the United States are wrestling with the same threats to their financial survival. The rapid and precipitous decline in advertising revenues for traditional print media has not been offset by income from their digital offerings. Those advertising revenues are being vacuumed up by giant news aggregators Google and Facebook, which pay nothing in Canada to the creators of editorial content. The problem is exacerbated when media companies are owned by vulture (hedge) funds, whose excessive profiteering is destroying newspapers in both countries. Companies have made severe cuts in their newsrooms and other departments in order to shore up the bottom line or to keep up with interest payments on massive amounts of debt, as is the case with Postmedia, Canada’s largest newspaper publisher. Having slashed more than 3,000 jobs since 2010, Postmedia is “gutting Canadian journalism,” said Martin O’Hanlon, president of CWA Canada, which has repeatedly called on the federal government to take action. The Columbia Journalism Review charts the closure of newspapers in the United States, where more and more communities no longer have a daily local news outlet.